Unionist politicians have slammed Sinn Fein over its call for the Northern Ireland football team to cancel an international friendly against Israel later this year. After meeting with Irish Football Association (IFA) officials yesterday, the party’s Culture, Arts and Sport spokesperson, Sinéad Ennis, called for the game in Belfast on September 11 to be cancelled. 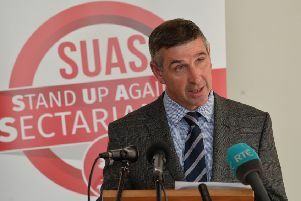 “I am calling on the IFA to cancel this match and send out a strong signal that the slaughter of Palestinians in the open-air prison which is Gaza, is completely unacceptable,” the South Down MLA said. Her call came the day after Argentina announced they would not be playing Israel in a World Cup warm-up match in Jerusalem this Saturday, following pressure from Palestinian football officials and campaign groups. Mr Campbell, who hopes to attend the game, said it was “wrong” for the party to be politicising a football match. His party colleague, North Antrim MLA and Northern Ireland season ticket holder Paul Frew, added: “I love the Northern Ireland games, and for anyone to politicise it in this way is really bad form, horrendous actually. “Football breaks down barriers, it brings people together. There is no reason why we shouldn’t play this game. “The Israeli football team and their association will be concentrating on football and sport, not politics or the security situation within their country. The IFA said it “has no intention of cancelling” the international friendly. Following Sinn Fein’s call for the friendly international to be cancelled, Mr McAllister said: “As a supporters’ organisation, we have consistently encouraged fans to leave their political views outside the stadium and to focus on supporting our national team. We maintain that viewpoint.